In the movie Notebook, produced by Nicholas Sparks, the first scene focused on an old man. When he opened the book, time flashed back. A poor country boy Noah so desperately fell in love with a rich city girl, Allie. They argued a lot during the whole summer holiday, so Allie left. But they both regret for without saying goodbye to each other. Noah wrote 365 letters to Allie, Allie was terribly tempted to keep thinking about Noah. 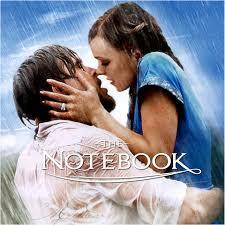 She wrote the notebook to release her emotion and fortunately, they were reunited years later. Allie remembered less because she got Alzheimer’s disease, but Noah didn’t give up on her. He started to read the notebook to Allie every day for waking up her memory. One day, Allie surprisingly went to Noah’s room because that day was their wedding anniversary. She embraced Noah and gave him a big kiss. She remembered everything and Noah. This movie shows how powerful love can overcome everything, even time and encourage everyone to pursue true love, cherish them for a whole life and believe everlasting love real exists.